Leggett & Platt brings you a pillow that's a combination of feather and down designed for supportive sleep and natural, deep comfort. A pillow is a big part of a good night's rest and one being used that's overstuffed, too thin, or causes allergies can ruin your sleep quality and the way you feel in the morning. The feather and down pillow is engineered to retain loft and provide unparalleled support so that you feel healthier by achieving the rest you need. 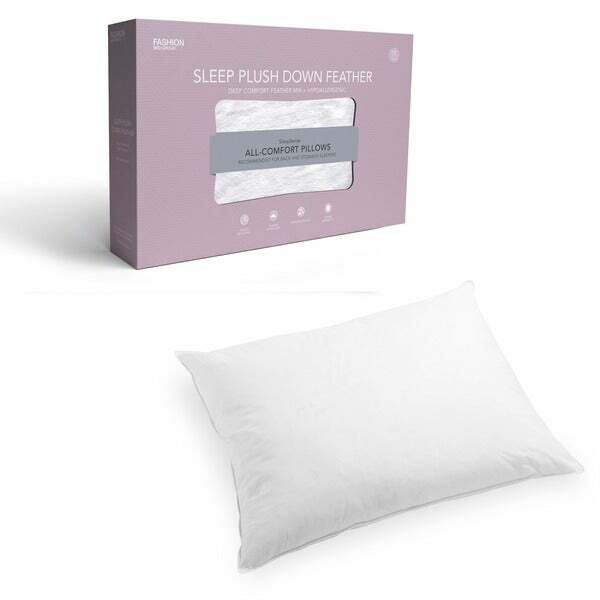 Constructed of a 95/5 white feather and down inner filling mixture, this pillow has been washed and treated to be hypoallergenic/ antimicrobial. The feather and down filling has outstanding fluffability, will naturally conform to the head and neck, and offers the advantage of softness and ability to take shapes desired by the user. The exterior is crafted with a super-soft, 300-thread count, 100-percent cotton cover that have been down-proofed, which helps prevent feathers from poking through the case. This item includes a zippered carrying case with handles for easy portability. This is a great pillow. Unlike the other special pillows that I've tried this one is very comfortable and can be adjusted to fit my head from sleeping flat on my back to sleeping on my side. Amazing nights sleep ! I love these pillows the price was great and they are so comfortable. I would recommend these pillows to everyone ! I purchased 2 of these pillows Absolutely love them. I generally go to an expensive depa6store ,& tru lm y pay triple for the same product that Overstock offers. I sleep like a baby!! item is good quality but does not seem to hold shape long. I love this pillow. Outstanding deal for the money! I bought them as a gift and my husband loves them. very happy with the value! I am always looking for a good feather pillow. I enjoy the pricing of overstock. Have yet to be disappointed.